It’s 4:30 am and I’m still awake, probably because I’ve slept for hours yesterday afternoon. I don’t really mind, though. My circadian rhythm is most certainly fucked, however, and it’ll probably take the relaxed period of Christmas to return it to normal. I’m not complaining, though. I finally finished Thomas Carlyle’s Sartor Resartus, although I didn’t read it as intently as I desired at first, primarily because the content was quite boring. The fact that I’ve finished it, at least, relieves me of its burden. I can study for my exams later on, and probably start reading The World We Live In (I can re-read Petersburg during Christmas time). I think I should fulfill that small promise to myself of completing the seven books I’ve bought over eBay before buying anything new. I’ve already read one of them, and it’s a poioumenon, although a bad novel. I want to finish the final ten episodes of Touch primarily because I don’t want to be bothered with not completing it. I have two exams the next week and a small-group discussion so I don’t want to be fettered with Touch during such a hectic week. There are so many things I want to purchase. I have the money and the capability, but I must caution myself so as not to be like my older sister. Purchasing different merchandise is all right; however, it’s an excess of it that is detrimental to anyone. I already have seven books. I haven’t even finished one of them. I have more or less 20 games, and there’s only about five I often play. That’s not good. I buy for the sake of hoarding, not for the sake of using them. I should learn to control myself, so until I’ve read through at least five of the books that’s sent to me, I will most certainly avoid purchasing anything from eBay (unless it’s my dad’s book, of course). While I was looking for another book to read in a used bookstore, I saw a dusty and old book with an interesting blurb. It reminded me of Endo Shusaku’s Silence. Kitzo Hekotormos is an unknown author: one would have a hard time looking for him in Google, but he’s a brilliant writer. Instead of dealing with the consequences of religious revolution during the samurai era, he dealt with their search for meaning in a world that thought of them as more and more useless. It wasn’t about the ethical or moral thing to do: the struggle became more basic – how can one live on? I dismissed the cover for its gaudiness, but the book is one of the best novels I’ve ever read. It’s said that he’s only written two novels and two poems, but I should think Quietude and Diffidence is his best work. I bought the first edition of another translation of Petersburg yesterday. One of the reasons why I bought another edition is to make sure I am going to read the novel once again. While the translation by Malmstad and Magure is top-notch (many readers deem it to be the best translation of Petersburg, with copious notes and proper description of the nuances of Bely’s text), I want to read the unwieldy version by John Cournos so that I will be forced to revisit the novel. The first edition of V.
It’s been a while since I have updated this blog, and that is due to the string of exams these past few days. I desired to obtain the first edition printing of Thomas Pynchon’s V., but since most of those for sale are quite expensive, I asked help from my aunt and even specified the book to obtain so as I’d be able to procure one of the better first edition copies. I’m actually after the book because of its dust-jacket art, but it would please me a lot if my aunt would actually be able to purchase it for me. I will read it in preparation for my psychiatry class next year, but more importantly I will read it because I find it very intriguing as a debut novel. I finally used up my Degree deodorant after quite some time. Aside from that, there was little that was memorable about today besides it being the last day of September. I did attempt an experiment with the chalky remnants of the deo-stick, and allowed it to dissolve in the toilet basin (after I urinated in it). Since that deodorant had an antibacterial ingredient in it, I was wondering if it would be able to control the stench from the urine. Surprisingly, it was able to clear both the water and stifle the smell from the urine. While I didn’t have a boring day, it just wasn’t eventful at all. I was able to talk to a friend I haven’t conversed with for some time, and that made me somewhat glad. Nothing much happened, however, but at least I now know that certain deodorants also work with urine (in certain conditions). It took me a good while to convince myself to stop pining for this item on eBay (I wonder if it’s still around?) because it is essentially just a prototype of the Tomy Blip that became popular during the late 1970s for its portability despite its limited gaming capabilities. After all, both were merely electromechanical renditions of the Pong game that triggered the rapid evolution of video games. Unlike the Tomy Blip, however, the TV Tennis was an unwieldy game. Because it was manufactured earlier, it did not have the portability that was the selling point of the Blip. 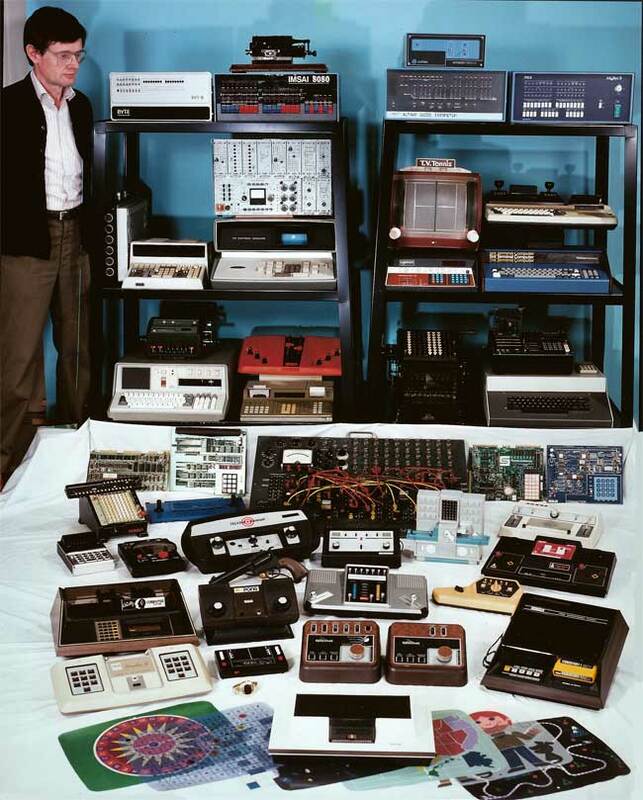 It was a huge system, as can be observed from the picture depicting the different examples of vintage computing. The Blip was the forerunner of the portable video game console, and it gave people something to do and enjoy during their trips. On the other hand, TV Tennis did not become popular because of the fact that most American households had televisions anyway and had no need to purchase something so large and extraneous. Instead of purchasing an electromechanical hack of the original video game, why not enjoy the video game itself? The TV Tennis system came out, after all, during the time where Pong-type video games were slowly becoming cheaper due to their market saturation, and some were even coming out in color.